It’s week #2 of the NSP Euro Tour and tomorrow we see one of Europe’s most iconic races: The SUP Race Cup in Sainte-Maxime, France. 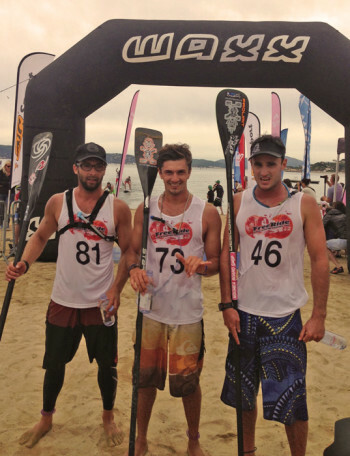 This race has seemingly been around forever (I believe this is the 5th installment) and has done a lot for SUP racing in Europe in that time. This year it’s missing a few of the international stars who made it to France 12 months ago, so I’m predicting an all-Euro battle in Saturday’s 7km Beach Race and Sunday’s 17km Long Distance event. Look for the likes of Eric Terrien, newly crowned ISA World Champ Titouan Puyo, young gun Arthur Daniel, old guard Greg Closier and Italian gun Leonard Nika to be battling it out. Also watch for guys such as Branislav Sramek (who doesn’t like a course race but is a serious machine in the distance), our roving reporter Vincent Verhoeven (don’t forget to take some notes at each buoy turn buddy! ), Martin Letourneur (rising star in France) and Dylan Frick (who made the trip all the way from South Africa) to feature in the top 10 as well. If I had to predict the overall event standings right now I’d say: Eric, Titou, Arthur, Leo, Greg (in that order). Over in the women’s I’m not sure anyone can get past Sonni Hönscheid. After today’s Beach Race it’s no surprise to see Eric Terrien on top of the provisional standings, however the longstanding King of France clearly has a few rivals to his throne these days, with the likes of Titou and Arthur Daniel right on his tail. Sonni Hönscheid continued her excellent form this year, taking out the women’s Beach Race in 38 minutes. I expected Sonni would be too strong today and have no doubt she’ll make it a clean sweep in her favoured distance race tomorrow. However not too far behind was Europe’s rising young female star, Manca Notar, definitely a name to watch in the future if you somehow weren’t already aware of her. Coming home third and scoring some podium time for the host country was the local favourite Olivia Piana. And after a less-than-stellar performance in the past few races, this armchair pundit has returned to form by correctly picking 4 of the top 5 men as well as the winning woman. You’re welcome. Eric, Titou and Arthur: Please stay in your places tomorrow. Though Leo and Greg: you’re both gonna have to move up one spot in the distance for me to get a perfect pick… Davide you’re kinda messing it up dude. “Today’s race was fun but hard… The buoys were perfectly positioned to make a good show. It was a mix of upwind and downwind… We had a really long upwind paddle, about 500 metres, to the golden buoy. However we also had some good downwind sections as well as. Some perfect long bumps allowed some fun little surfs! Eric had an amazing start with the perfect line and turned the first buoy 50 metres ahead of the rest of us. In the meantime Titouan had an absolutely awful start, turning the first buoy in around 25th place… But as usual he managed to catch each and every bump up until the end of the race, working his way through the field all the way up to 2nd place! 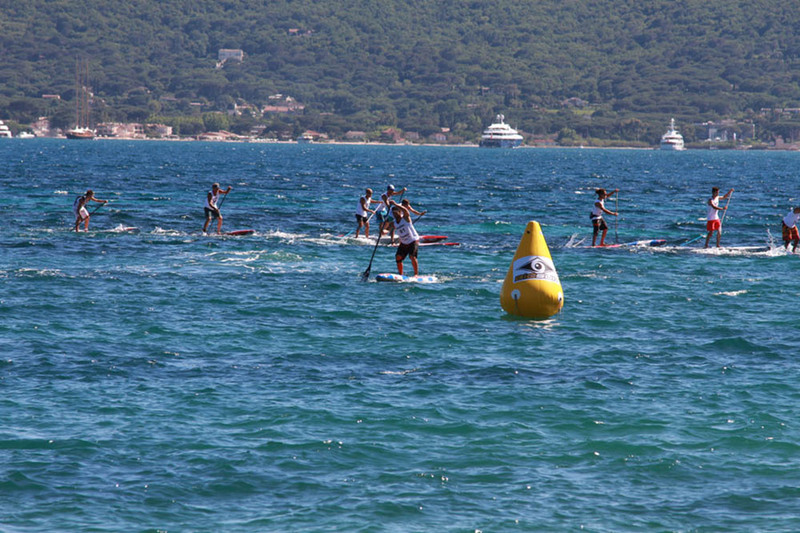 Also very impressive paddling from Davide Codotto who looks really strong! Thanks for the update Vince! The Long Distance race has *just* finished and Titouan Puyo (Ti2!) has won very close, a three-way sprint to the line against Leo and Eric. So what does that mean for the overall event title? 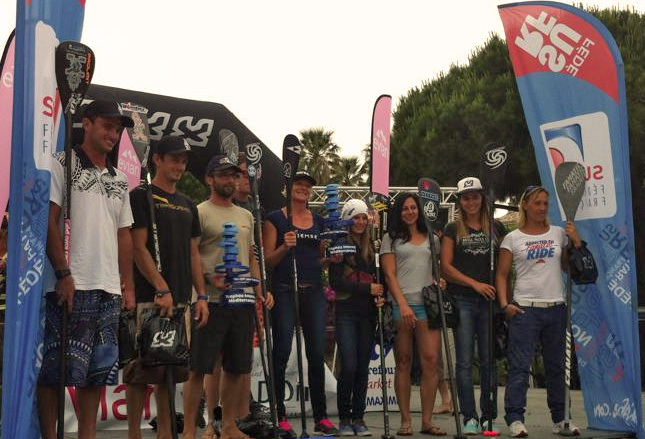 The times from today’s Long Distance Race and yesterday’s Beach Race are combined to produce the overall results. 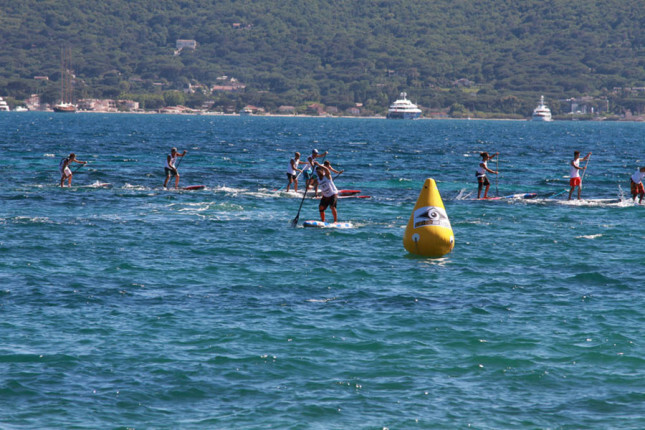 Yesterday Eric beat Titou by 16 seconds; today the positions were reversed but the margin was only 8 seconds… So that means Eric very narrowly claims the “International Mediterranean Trophy” awarded to the SUP Race Cup champions. Greg Closier showed great form to lead the second pack home today ahead of Arthur, Martin and Davide and also move into the top 5 overall. Over in the women’s, Sonni Hönscheid made it a clean sweep for the event, taking out today’s Distance Race while Manca Notar was once again second. 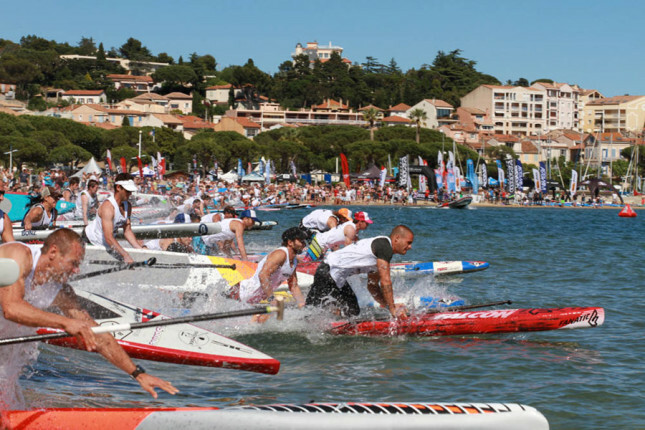 The trading of 1-2s by Eric and Titou officially establishes what we’ve kinda suspected for a few months now: There is a new order in French (and perhaps even European) SUP racing. Titouan has been on a bender ever since he came out of nowhere to win the French National Titles distance race late last year. In the past eight months he’s also won in Australia, Nicaragua and has this weekend proven once again he’s the only guy who can regularly match Eric at home. Throw in a couple of rising young guns who are right on their heels – Arthur Daniel and Martin Letourneur (plus Arthur Arutkin if he ever wants to stop windsurfing…) – and the future looks very bright for the French. Also great to see one of the original guard, Greg Closier, return from a major injury last year with a very solid performance. 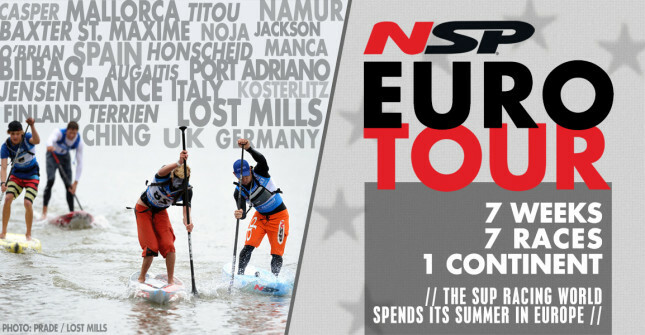 That’s a great sign for SUP racing in Europe and a great way to end Week #2 of the NSP Euro Tour. Next week is a quiet one, with a bunch of regional races but no headline acts. However after that we hit four straight weeks of big international races in June, starting with Bilbao on the 7th/8th and peaking at the Lost Mills on the 21st. Big thanks to Brecq Benoit from Hoff/NSP France for the quick pics, as well as Vincent Verhoeven and Martin Letourneur for sending me the results super fast.